I just finished a new design in time for TNNA in June. It is a triangular shawl worked from the back neck down. The shawl was actually inspired by a call for submissions from one of my favorite publishers, who is doing a Jane Austen themed publication. I chose Sense and Sensibility, as we have the movie and I enjoy the story. This is one of her first (maybe the first published) novels. 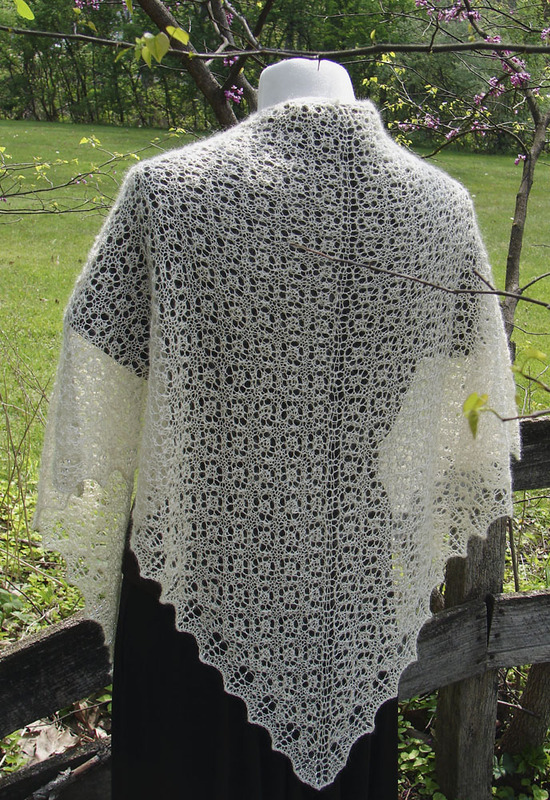 In the movie, the Dashwood sisters wear these beautiful everyday shawls, and so I decided to do a shawl utilizing some very old stitch patterns. I had participated in the Great Wall of Yarn for TNNA last June, and swatched the design in Colinton 2000 from Colinton Angoras. Many designers I know help knit swatches for the Great Wall of Yarn, a special display at TNNA (the June trade show). It gives the shop owners and industry attendees an opportunity to see the yarns in the display worked up, and it gives the designers more visibility. I was delighted when I received Colinton Angoras lace weight to swatch, as I had asked for lace weight yarn. I had not picked a yarn for this design yet. they liked the swatch and the result is that I have found another wonderful company to work with. The yarn has a beautiful luster, and is springy and lively. It is amazing how it looks when blocked compared to when knit. When the knitting is in progress in any lace, you have to see it pinned out to appreciate it’s’ beauty. The yarn itself felt nice in the hand and was easy to work with. I have other ideas in mind for this yarn, and will of course share them here when they are done. I pinned it out to 72 inches wide along the top of the shawl, and 33 inches from the top to the bottom point.